There are many reasons why salons might need plus size chairs, let’s take a look at some of these reasons. Stability – For clients as well as your staff members, a stable seating surface is important when doing minute work on the face or hair of the client. A plus size chair means your client and your staff is confident that the client will not slip, slide, or be uncomfortable during long sessions. Ease of Work – A comfortable and stable client means your team members can work on the hair or face of the client with added ease. This further means a happy and satisfied client who will choose your salon for repeat business. Client Comfort – The comfort of the clients is paramount for any business that requires clients to be seated. Plus size salon chairs give the clients a sense of ease in knowing that they will not fall out of the chair or be uncomfortable during long seated sessions. Multiple Options – If your clients are on the heavier side, they might have trouble in getting in and out of the chair. 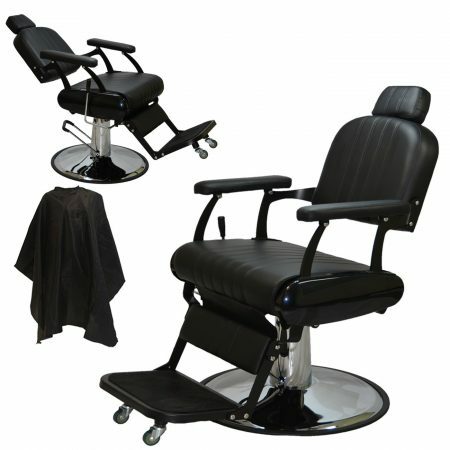 Modern salon chairs are designed in a way that getting out of the chair is easier for heavy people. This adds another level of comfort for your clients who want to be at ease while going through a haircut or a facial. Durability – Plus size chairs for salons are designed with heavier clients in mind which is why they are made with durable materials that will last for years. Even with regular usage, you can expect these chairs to last longer than regular salon chairs and they pack back for their price when you do not need to buy new chairs for your salon. The LCL Beauty Classic Chair has several features that will delight plus size clients. This chair is made from comfortable materials and it is durable enough to handle the difficult requirements of the salons that get a lot of traffic. The chair can be adjusted to suit the height and weight of clients, and it comes with four positions for adjusting the height of the headrest. The headrest can also be removed if needed. The black color of the chair looks chic and sophisticated. Most of all, the chair comes with a hydraulic pump and a 27” base for added stability. The chair has a weight capacity of 400 pounds which ensures even your heaviest clients will be able to sit in this chair with ease. The LCL Beauty Reinforced Hydraulic Styling chair is the perfect chair for large sized clients who want to sit comfortably while getting a shave or a haircut. With 500 pound capacity, this chair is perfect for most clients who are plus size. The chair has a 25” wide seat that is steel-reinforced and designed for maximum comfort. The backrest of the chair is vented with a dual cushion design to provide ease of movement to the users. You can also use the hydraulic pump to change the height of this chair in the range of 21”-27” from seat to floor. 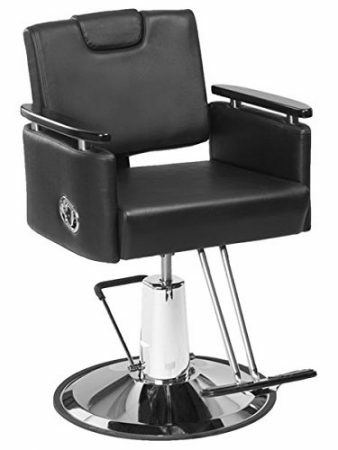 If you are looking for the ease and comfort of the customers, this is the perfect chair for your salon. The Merax Hydraulic Reclining Chair offers an ergonomic design that is ideal for all modern salons that cater to plus size clients. 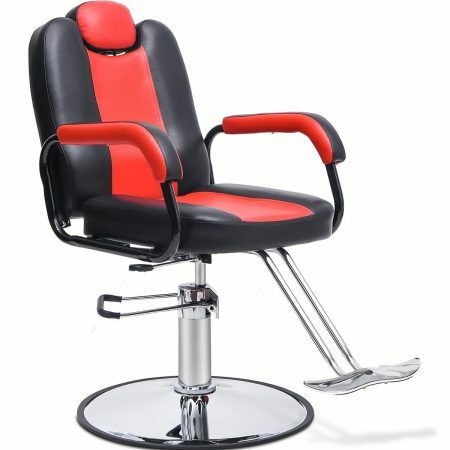 The chair is designed to be comfortable for large clients who want to sit comfortably through their haircut or facial. The contours of the chair are designed to support the natural contours of the human body, and the chair provides ideal snug support for the lower back, torso, and neck. The chair is also easy to clean as it is made of high-quality PU leather that is stain-resistant and waterproof. The chair’s highly durable frame will last for years as it is made from heavy-duty steel with a rubber-reinforced chrome round base. The chair has a weight capacity of 380 lbs, and it is wide enough to accommodate plus size clients. 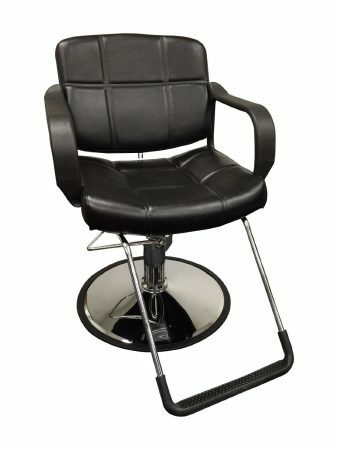 This wide hydraulic chair is the perfect choice for salons that cater to plus size clients. The large chair is 20” wide, and the seat is double reinforced for additional durability. You can also adjust the height of the chair as per your requirement. The chair is made from a heavy duty steel frame that has a chrome base for added stability. An elegant footrest adds to the looks of the chair and the comfortable armrests make it easy for clients to adjust when they sit in the chair. The chair has a weight capacity of 230 lbs which makes it ideal for clients that are on the heavier side. The BR Beauty Carlton Salon and Barber All-Purpose Chair is a spacious and comfortable chair that is perfect for salons that cater to plus size clients. The chair has a wide seat, adjustable headrest and the adjustable height with the help of a hydraulic pump. The black lacquer finished arms of the chair provide a stable place for keeping the arm, and the upgraded vinyl material of the chair offers ease of sitting even during long styling or hair cutting sessions. With a wide chrome base, you can rest assured that the chair will be stable during all use cases. The weight capacity of the chair is 350 lbs. Buyers often have questions or queries regarding a purchase that they have made or they wish to make. 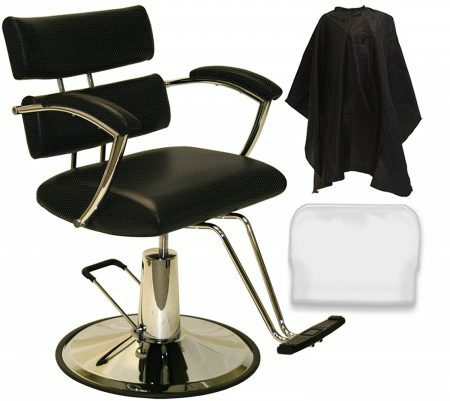 Here are some of the frequently asked questions about plus size salon chairs. Q1) This is the first time I am considering buying a plus size salon chair. What is the one thing I should keep in mind while looking for a model to buy? Ans. There are many features of the chairs that you should keep in mind, but the one primary feature you should look for is the weight capacity of the chair. In this case, get the highest weight holding capacity possible. Q2) I bought a chair but now it’s getting dirty with hair and shampoo stains. What is the best way to clean a salon chair? Ans. All shampoo chairs have different materials, so there cannot be any uniform cleaning guidelines. Consider checking with the manufacturer of the chair for exact cleaning instructions that are best for the material of the chair. Q3) I regularly have clients that need hair shampooing. What features should I look for in a plus size chair for my use case? Ans. Make sure the chair you buy has the reclining ability. As most shampoo bowls are closer to the ground, the chair will need to be reclined lower to make shampooing easier. Q4) Are there any precautions I should take when my plus size clients sit in a chair? Ans. Make sure the chair is in a stable position on a firm surface and it does not lean to a side. Pump the chair to the desired height before your client sits in the chair. Buying a plus size salon chair is the best option for you if you get a lot of clients who are large in stature and on the heavier side. This can cement your reputation as a salon owner who is careful about the needs and comforts of the clients. When your clients feel comfortable while getting a haircut, a facial or a manicure, they are more likely to visit your salon again. A large chair will also allow your team members to work with added confidence as they will know that the client is sitting comfortably. In all, a plus size salon chair is a great investment for any salon that will provide great dividends by adding to the reputation of the salon and creating word-of-mouth publicity for the salon. We hope that this article has been illuminating enough to help you zero in on the best plus size salon chair for your establishment. If you have any queries or questions, please feel free to discuss those in the comment section.